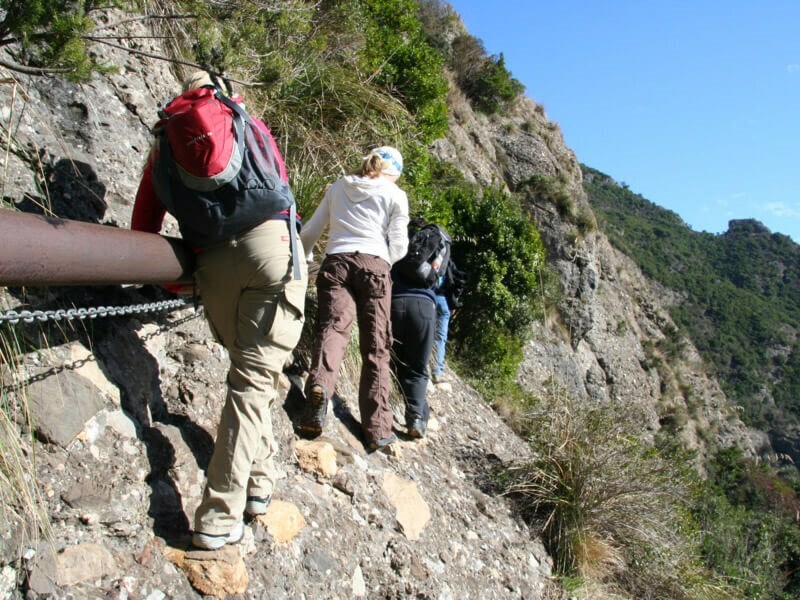 The "Trail of the Tubes" (in Italian "Sentiero dei Tubi") is one of the most spectacular and exciting trails of Mount Portofino Natural Park. The path runs along the ancient route of the aqueduct, inaugurated in 1899, which from the area over San Fruttuoso, through a cement pipe runs towards the village of Camogli, crossing the Mediterranean scrub and the large conglomerate rocks, close to the remains of German World War II batteries. Today the upper part of the aqueduct is used as fire-fighting water supply, while the lower one, toward the sea, still carries the water from the small village of Caselle to San Fruttuoso. The trail follows the old pipelines that cut for five kilometers the steeper side of the Promontory, passing through four tunnels: this requires the use of flashlights. The most exposed passages are equipped and secured with ladders and chains. Given the high difficulty of this itinerary, hiking along the “Trail of the Tubes” is permitted only with a guide of the Park of Portofino and recommended only for experienced hikers. Difficulty: very curvy path, with dark tunnels, overhanging rocks and some stretches equipped with chains. It is necessary to have a flashlight, long pants and be accompanied by a professional Guide of the Park. Do not recommended for those who are afraid of heights or suffer claustrophobia. Height difference: about 250 mt.